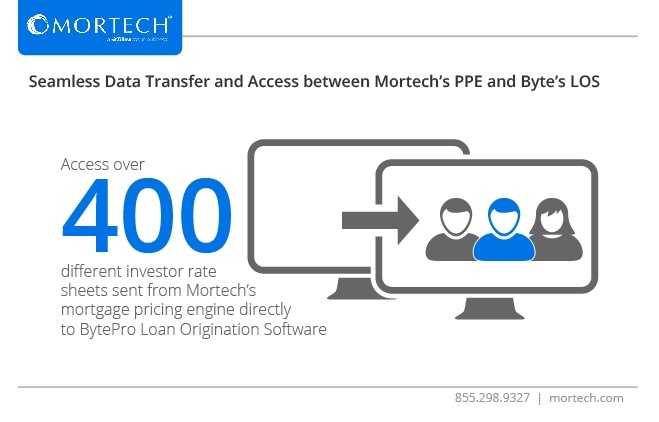 At Mortech, integrating our mortgage pricing engine with industry leading mortgage partners is a top priority, so that we can continue offering the best options and services to our users. One integration that we made late in 2016 was with Byte Software’s BytePro loan origination software (LOS). With this integration, Mortech users can access Byte data directly from Marksman, and vice versa, via a seamless transfer of mortgage data between the two systems. This allows users to streamline their workflow and keep everything on a single interface, saving time by increasing workflow efficiency. Access of this data lets users view and compare loan pricing and eligibility from over 400 different investor rate sheets all on one screen. The integration and data flow also eliminated redundant data entry, preserving the integrity of your LOS workflow and keeping all of your data entry consistent. What’s more, users can even automate lock requests, as well as automatically capture loan specific rates, pricing and adjustments, profit margins, and other details. Not only does this keep your data safe and compliant, but it speeds up your day-to-day processes. There’s a lot of reasons to like Mortech’s integration with Byte. We seek out those integrations specifically because of how they help our users improve their business and make themselves more efficient. Want to know more? Reach out to your account manager today and ask them about how to streamline your workflow with Byte. Not a Mortech user? Not a problem; simply reach out to us today and find out what you could be doing with Mortech’s mortgage pricing engine.